Minestone exports is registered member of fieo- federation of import and export organization setup by ministry of commerce and govt of india. Minestone Exports is continuously striving for Ethically Trading. We want to assure our customers that the stones they are buying are sourced Ethically. In this view are are being Audited and the audit report is online on SEDEX Website. 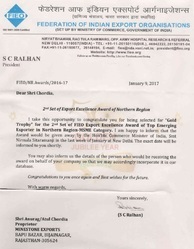 Minestone Exports is selected for "GOLD TROPHY" for 2nd set of FIEO Export Excellence Award of Top Emerging Exporter in Northern Region-MSME Category and the award is given by Hon'ble Commerce Minister of India , Smt Nirmala Sitaramanji.